I want to thank my beekeeper for learning to be such a great sport about being in so many pictures! Someone’s got to represent us in front of the camera, right? We kicked off Saturday at the Pearl market and took off for Williams-Sonoma’s Artisans’ Market once Sonia and Jessica showed up to relieve us. The weekend markets and events are often our rewards for working all week – we enjoy interacting with customers and talking bees, candles and honey and even non-bee-related stuff on ocassion. 🙂 We want to thank the staff of Williams-Sonoma at La Cantera. It was a lot of fun and they really took good care of us. We thoroughly enjoyed it and are happy we were included on the invited list. 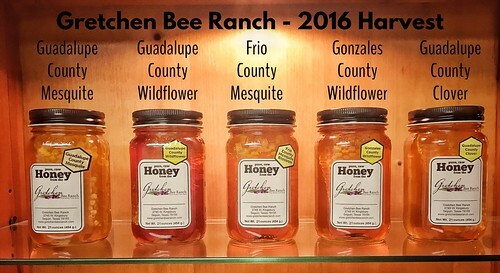 In other news and development, we are pleased to share with you that Poteet Country Winery has now received their second batch of honey from us and are carrying Guadalupe County Wildflower and Frio County Huajilla at their store in Poteet. We have not had a chance to visit them yet but we are looking forward to it and of course will share some pictures with y’all. For now, you can find and support them at the Pearl Farmers Market on Saturday mornings, they’re just down the row from us! One last thing – besides the fantastic produce we have access to at market, we also benefit from our friends using our honeys in different ways. 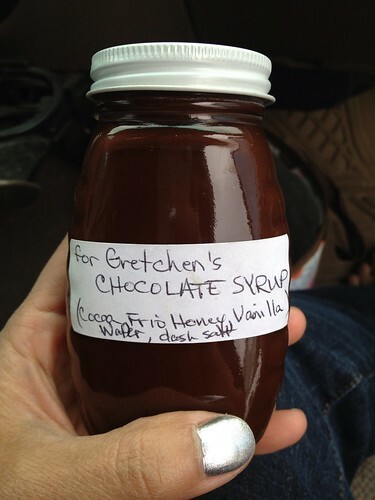 Here’s a gift we received from our Sprinfield Farm friends – homemade chocolate syrup – YUM! It is so fun to learn what others use honey for in their lives and products. The list of recipes and uses continue to grow! 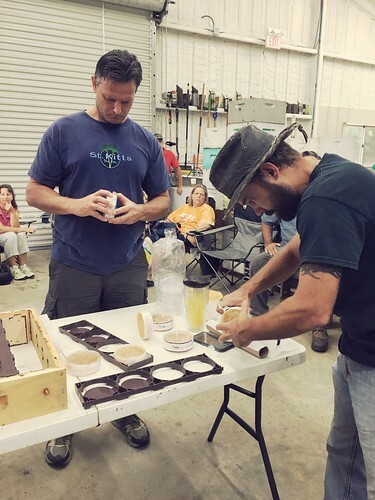 For wax: shoe polish, wax polish, artwork, iron work coating, scrubs, soaps, balms and salves, lubricant for sewers, quilters, and woodworkers. 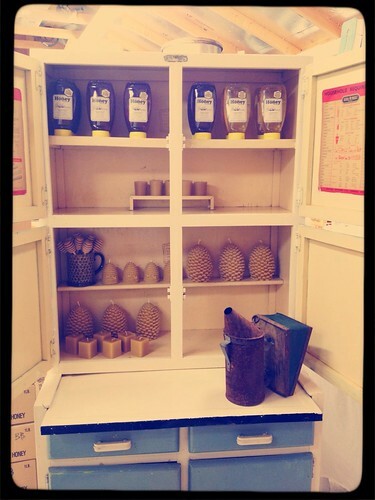 The first picture is our work in progress with the hutch we found for our retail display at Gift & Gourmet. EXCITED is an understatement about wanting to see their new location downtown. They have been renovating an old building and Mark said it looked great today when he stopped by there to speak with the owner. He said it brought William Sonoma to mind. o_o I l-o-v-e that store. Too bad I don’t make a lot of money so I can go buy things there all the time. 🙂 Anyway, sounds like we are going to have our very own WS shop in town and I am thrilled. I have love Gift & Gourmet since before I even moved to Seguin. They are exquisite – product and staff alike. Check them out if you haven’t already. 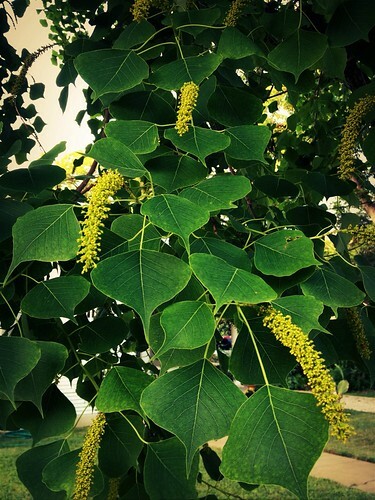 The picture below is a Chinese Tallow, one of two we saw on our walk Sunday evening. Bees love it and we saw a couple on there so maybe they are our little backyard girls. There are two things I want to share with you about this – 1. I almost never remember the correct name of this tree. I tend to call it a Japanese Tallow and sometimes I get it right but second guess myself so that now it’s a game with me and Mark to see if I get it right. 2. The fact that we went for a walk that was about a mile, maybe a little over, is awesome news for me. I had stopped running and walking outdoors because my allergies had gotten so bad several years ago. But now that they are better (thanks local honey), I wanted to try it. So we did. And no headache. I am THRILLED. Thanks honey bees. We just got in from the honey house for the evening. We have been trying to finish up bottling and labeling local honey and when we finished that, we moved back to labeling boxes of specialty honeys. Man it is still hot out there. I was drenched by the time we called it a night. 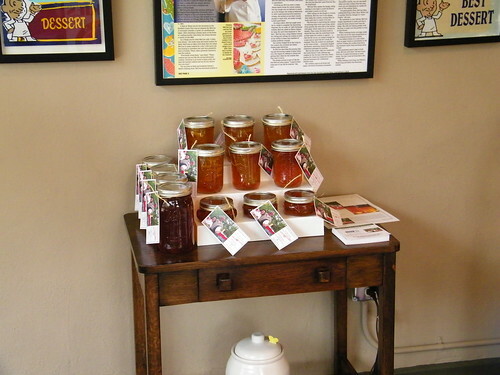 We also prepped for tomorrow morning’s beekeeping class as well as the 2011 Honey Harvest Sale Event from 4-8p here at the ranch on Krezdorn. More on that tomorrow. This week we celebrated our tenth anniversary – yay us! I got the day off Wednesday and we had a super fab day together. I don’t think we’ve ever been more busy or more happy. Our big meeting was with a representative of HEB, which is the larger grocer in Texas for those of you not from here. It was so flattering and exciting to be contacted by them and asked for product information. We feel the initial meeting went well and we look forward to hearing from them after they do some number crunching. The process was so interesting. I told some friends that I felt as if I was in grade school and I was waiting my turn to have a project judged. 🙂 Not stressful, just suspenseful sort of. We entered the lobby of the headquarters in San Antonio, along with several other people and their products. The above picture was the only one I managed to snap since I didn’t think anyone would want me snappy pictures of them waiting their turn. 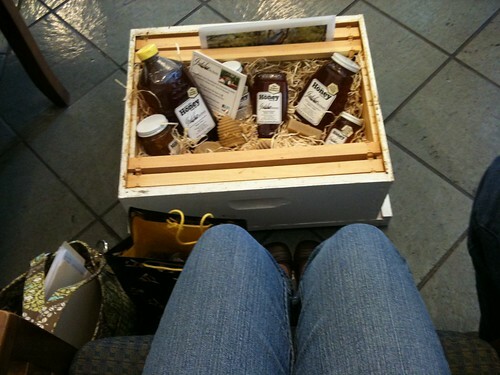 That’s me sitting there with our bag of samples and sampler box we made just for the visit. They got to keep the sampler box. Lucky! We met two very nice men who were from New Mexico I believe. They were presenting a new package of beer that HEB already carries in some of their 300 stores. They gave us some input on their experience working with HEB and it was all positive. They said it was a “life changer” if you get to partner with the store. In a good way (when we asked which way they meant lol). So here’s to HEB and the possibilities. We’ll keep you posted! Other work included Mark trekking out to the yards to check on the queens from Derwin Thrash of Mississippi. Great news – all queens were accepted AND some of them had already gotten super busy and had several frames of eggs laid. Mark was very, very pleased to see this. He’s ordered more queens from Derwin and will use them when he divides the remainder of the hives in September. Derwin was mentored by the awesome JN Russell. We still think of him and miss him dearly. Wish we could still visit and have a cup of tea and some of his pecan pie made from scratch. We are so glad to carry on with Derwin. 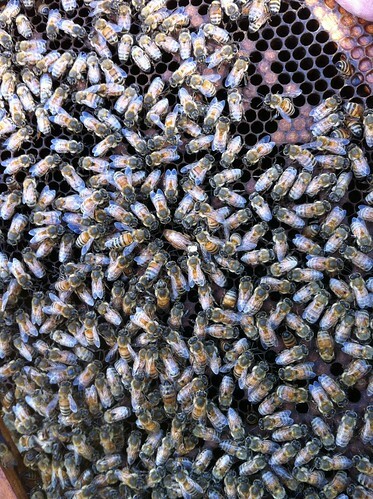 Today is pretty significant for Gretchen Bee Ranch! We are very happy to share that our honey is now available in our very first retail outlet – the wonderful Lily’s Cookies of San Antonio. 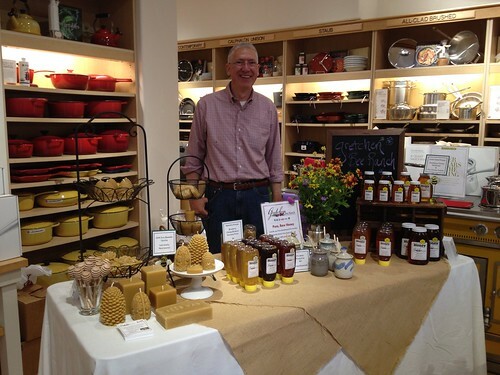 🙂 Mark took several cases and orders in for a San Antonio delivery today and stopped by the shop to set up a display of our honey. I sure wish I could have been there with him for this first but I am happy to see a few shots of the setup and he had a great time doing it and working with the folks there. Where to begin! 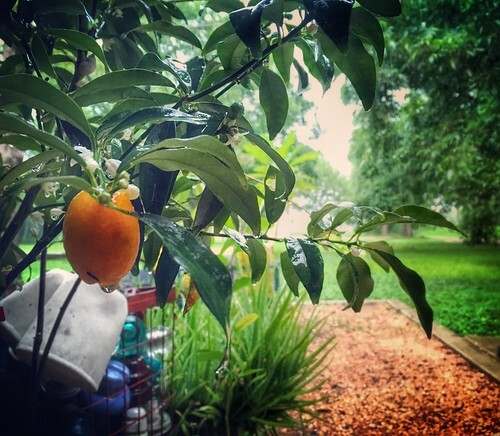 I used to live in the Monte Vista area of San Antonio before Mark and I married and I love, love, love the small, locally owned shops in that area. 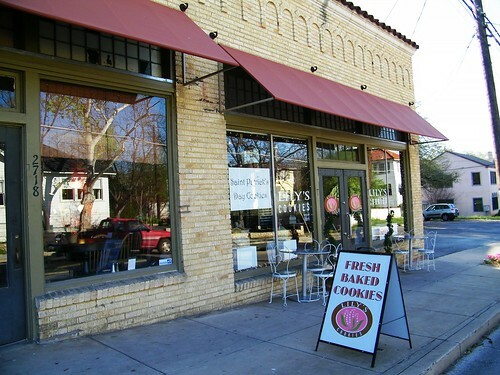 I discovered Lily’s Cookies many months ago when I drove down McCullough for old times sake. I stopped in for a cookie, fell in love, snapped a few pictures…and the rest is history. And as with all places and things I appreciate and love, I started sharing with my friends how great this cookie boutique is – it’s more than just a bakery, it’s an awesome experience! Christine is the owner and she and her staff are wonderful – friendly and helpful. And the cookies are both beautiful AND delicious. Their creations are divine. 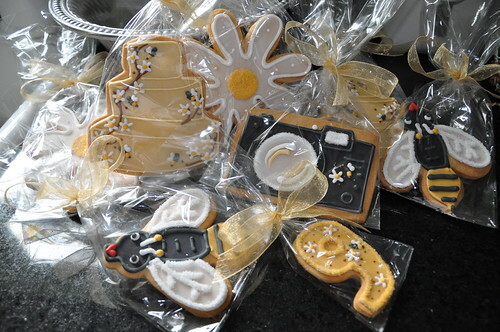 Though I love the cookies for myself, I enjoy even more picking out special ones for those I care about – like these special anniversary cookies Christine and her staff made for us so I could surprise Mark back in July. They were so great, I could hardly bear to bite into them. Mark liked them a lot and dug right in. 🙂 Ok, I know I’m going on and on but it’s because I’m so excited about this news and I can’t wait to visit next week. If you are in SA or passing through, please do stop by and check out the shop. You won’t regret it. We are very excited for the opportunity to partner with Christine on a this new adventure!